Tracy Stallard had a reputation for being a victim. The Cardinals gave him a chance to be a victor. The right-handed pitcher took advantage of the opportunity. On Dec. 7, 1964, in one of Bob Howsam’s first deals as Cardinals general manager, St. Louis traded outfielder Johnny Lewis and pitcher Gordon Richardson to the Mets for Stallard and shortstop Elio Chacon. The trade energized Stallard, who went from the last-place club in the National League to the newly crowned World Series champions. Stallard rewarded the Cardinals by producing the best season of his big-league career in 1965. _ Stallard posted a 6-17 record for the 1963 Mets. He followed that with a 10-20 mark for the 1964 Mets and led the major leagues in losses that season. Though Stallard was 1-3 against the 1964 Cardinals, he yielded just 20 hits (and no home runs) to them in 22 innings and had a 3.27 ERA. Uncertain whether Ray Washburn would recover from a shoulder injury, Howsam sought a starter to join a rotation of Bob Gibson, Ray Sadecki and Curt Simmons. The Mets were seeking an outfielder. Lewis, a rookie, began the 1964 season as one of the Cardinals’ regulars. He started 28 games in right field, but batted .234 with two home runs and seven RBI. In June, slowed by an ankle injury, the Cardinals sent Lewis to Class AAA Jacksonville. Mike Shannon became the Cardinals’ right fielder and Lou Brock, acquired by the Cardinals in June 1964 from the Cubs, became the left fielder. Bing Devine, the Cardinals general manager who engineered the deal for Brock before being fired in August 1964, had joined the Mets as an assistant to team president George Weiss. Devine recommended Lewis, 25, to the Mets. Weiss and his vice president, Johnny Murphy, negotiated with Howsam on the trade. “Devine stayed out of the picture,” The Sporting News reported. A week later, though, Howsam acquired another starting pitcher, Bob Purkey, from the Reds for outfielder Charlie James and pitcher Roger Craig. Stallard, 27, began the 1965 season in the Cardinals’ bullpen. He lost his first start April 24 to the Reds, then won his next three decisions as a starter, beating the Pirates twice and the Dodgers. After a win over the Phillies July 18, Stallard was 7-3 with a 2.80 ERA. Stallard finished second on the 1965 Cardinals in wins (11) and third in innings pitched (194.1). His 3.38 ERA was better than the team average of 3.77. His 11-8 record was the only time in seven big-league seasons that he posted a winning mark. 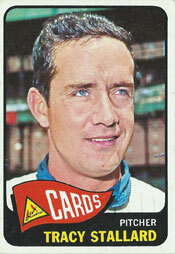 In 1966, Stallard was 1-5 for the Cardinals, who demoted him to the minor leagues. He never returned to the majors. His big-league career totals: 30-57 record, 3.91 ERA.